Although we've been busy behind scenes planning our second event here in Montreal headlined by Anthologic (which you can check out and RSVP to HERE), it's once again been way too long since we lay down and supported a nice release review on the CW URL. To make up for it this time we're going to present something very deep, very unique and very new, straight out of the Izu Province underground of Japan, released on Indigo Movement. Owned and operated by Greek producer Duckem, Indigo Movement is an imprint that CW has been following for quite some time, pushing a signature deep, hypnotic style of underground bass music out of London, UK and Athens, Greece. With successful, chart-topping releases from AKX, Argo & Dillard in the bag, Indigo Movement has been cited, supported and praised numerous times in the global underground bass music world by the likes of FatKidOnFire, Infernal Sounds and Juno Download to name a few. 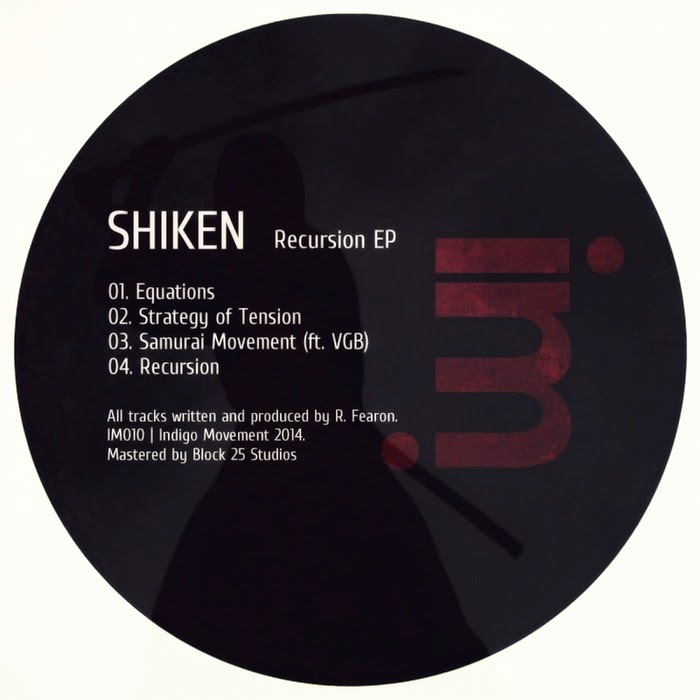 Released last Monday April 7th, Shiken's debut I.M release takes the listener through 4 diverse, bass-heavy tracks, touching on a variety of organic, tribal, industrial and futuristic sounds. Commencing the EP with an eastern influenced string solo, the track "Equation" drops heavy into a rolling, syncopated verse, incorporating a unique blend of organic drum hits with icy, futuristic percussion tones. Following up with a heavy half-time feel, "Strategy of Tension" features some interesting synthesizer panning, dissonant chords, sparse ethereal vocal sounds and eerie lead melodies. Teaming up with Dutch producer VGB on the highly anticipated collab "Samurai Movement", the duo together deliver a deep, hypnotic 140 banger. Built out of an icy, dissonant static intro, the track progresses into a meditative verse full of impressively crafted, precise mids and unsettling, channelled sound effects, holding an overall cold, futuristic, industrial atmosphere. Closing the EP, the title track "Recursion" is a futuristic, tribal roller, incorporating a unique blend of pounding, syncopated percussion sounds underneath of a whirl of tension-building sound effects and sparse mid growls.